Season 2019 promises to be another big one for the Tigers with growing numbers, more social events, and more new initiatives planned to support both player participation and talent development. Keep an eye out here, subscribe to the weekly email and connect with @richmondjfc on Facebook, Instagram or Twitter. Don’t hesitate to contact the Registrar if you have any questions or concerns. 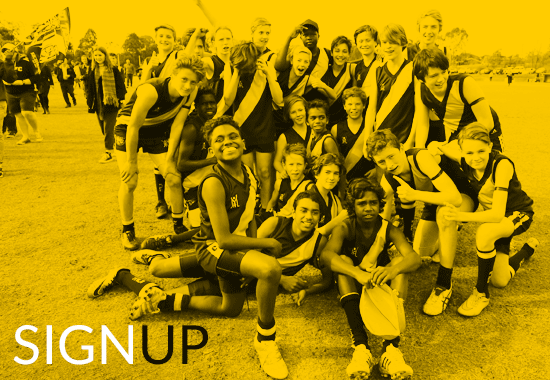 Update: Players looking to register for the Under 13, Under 14 & Under 15 boys teams should be aware that registrations have reached the ideal number, and any further registrations will be taken on the understanding that these players will be ‘Squad’ players as per RJFC policy. Please contact the Registrar for further information. Registrations are now open for both returning and new players. Of course we will always attempt to accommodate late returning players and new comers, however with growing numbers in all teams, we encourage you to please register as soon as possible to ensure your child gets a spot. Please see our policies for further information on team selection and player rostering. The new YJFL payment system requires full payment prior to the registration being complete. The season starts on Sunday 7 April 2019, with full season dates on our Calendar. Complete the online registration form. Note that payment is now required at this stage to complete the registration. 3. Get ready for a great 2019 Season ! Our registration fee is $270 per player. We have kept this the same as last year, and you will note the revised payment process is now online as you register, which automatically combines the YJFL, First Aid Levy and RJFC fees, and must be paid before the registration is complete. This fee remains exceptional value compared with other local football clubs and other sports. The club fees include the per player contribution to the “pink round” in 2019 in support of the Breast Cancer Network Australia (BCNA), when pink socks are provided for all players. You may recall when we began providing RJFC appointed Medics at all our home games over 2 years ago for the safety of our players and those of the opposition. We were at the forefront and leading the charge on this initiative. Now, the YJFL has implemented our suggestion, through the YJFL First Aid Levy, to take this initiative league wide to ensure the safety of all players at all grounds, home or away, throughout the YJFL. The club offers discounted fees for families with 3 or more players at the club – fees for the 3rd sibling are $190, then 4th or further siblings are free. If you are registering 3 or more players, please contact the registrar before completing their registrations. As always, we encourage all existing players to talk with school friends, neighbours, relatives, etc… and encourage them to join the mighty Tigers. At RJFC we aim to field as many teams as possible to ensure all local boys and girls remain in competitive sport. If you know of someone who might like a kick, please refer them to the website for registration details and just invite them along to training! Should you have any questions about the coming season, please feel free to contact any of the RJFC committee members and we will arrange for a quick response.